In the state of Madhya Pradesh – the truest ‘heart’ of India, rests a little hamlet surrounded by the Vindhya Mountains. It sits peacefully between two pronounced regions of the state – Bundelkhand and Malwa and witnesses an exclusive kind of silk churned out of its weavers’ looms. It’s a marvel how these tribal weavers belonging to one of the most backward communities in the country, and living a life of less privilege, can come up with fabric of this quality and class. The hamlet is none other than Chanderi and the fabric is its namesake. History has it that the fabric was in use as early as in the 13th Century. It is more of a generation-to-generation skill, passed on with all zeal and evolving throughout its journey. Arising in the Nimar region, the traditional form of Chanderi saree was absolutely a combination of silk and unbleached cotton, all the threads handspun. There wasn’t much of a colour variety; whites, off-white, and light hues were predominant. Borders depicted weft interlocking and the entire sari was a nine-yard magic with pallavs on either end. These creations found their glory under the royal patronage of the Maharanis of Gwalior, Nagpur, Indore and Vadodara, and of the Mughal Dynasty. Muslin weaving was the trend then, with spun counts as fine as 300. Although the raw materials were outsourced, Chanderi could still earn a high name in the trade market of India. Ancient tales talk about the fabric being gifted to the great Mughal Emperor Akbar in bamboo hollow. So fine was the cloth that it could easily fit in the little space, and still be big enough to cover an entire elephant! The fabric has undergone huge changes and how. The centuries-old weaving art is still as good as new. Golden zari still adorns the borders of Chanderi sarees. However, the interlocking technique has changed. Rather, the borders are now stitched onto the body of the sari. To bring in a colour burst, white saris are dipped in saffron water so that the threads imbibe the orange shade and smell alluring. These days, floral pastes are used to dye the threads and contract colours picked for the selvedge. The motifs still bear the influence of the bygone days – the Mughal ashrafi, trees, flowers, swans, peacocks, and all celestial bodies, nalferma, chatai, jangla, dandidar, mehendi wale haath, and more, alongside other local influences. The newest way of creating these motifs is the Jamdani. Muslin weaving is no longer used. Instead, thinner counts of warps are applied, contributing to the lightweight and gloss of the fabric. Chanderi fabric of today is popular for its unique sheen and transparency by dint of the Single Filature zero degummed yarns that are used. 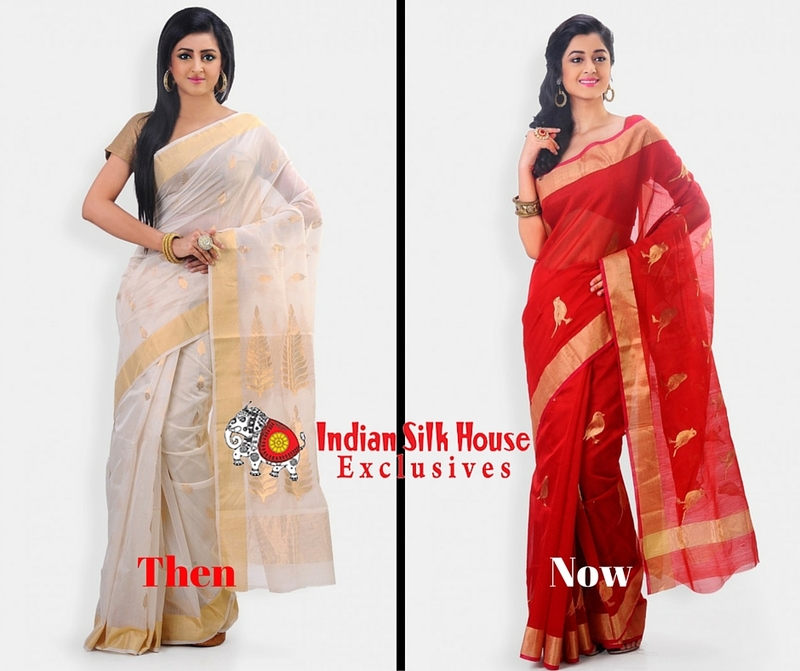 Ladies these days like to buy silk sarees online. And to satiate this very need, Chanderi is now available via various eCommerce clothing platforms. The popularity has only risen with the Indian Government tagging the fabric as a Geographical Indicator (GI) of the hamlet. This rich, regal fabric has also strived for an international repute and petitioned the WTO for recognition. These attires are best suited for summer wear. They are airy and offer the wearer comfort as well as elegance. From royalty to nobility – all can flaunt it. The most common forms of looms are the pitlooms, jacquard, and dobby, on which the magic yards are spun. And it takes almost a week or two to come up with the magic. These creations are worth the wait and money. They’d make a beautiful addition to your closet. 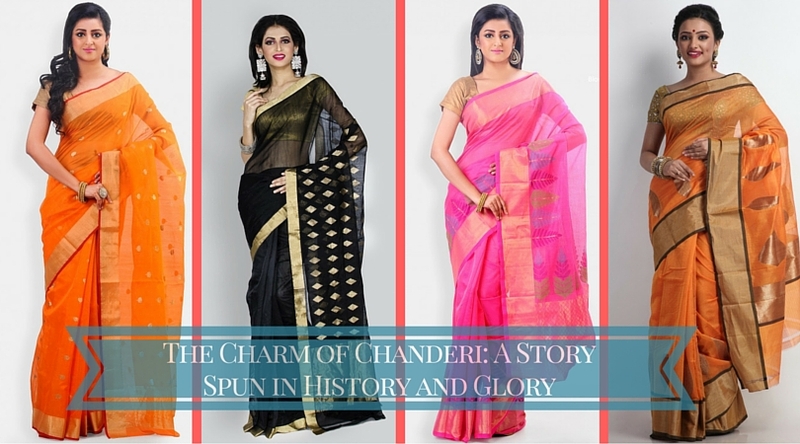 So, would you like to be the proud owner of a Chanderi Saree anytime soon? © 2017 Indian Silk House Exclusives. All Rights Reserved.